I just looked at the calendar and realized that my kids go back to school in just a little over 4 weeks. FOUR WEEKS? How did that happen? I feel like summer just got started. But it’s already time to start planning our back-to-school shopping — going through drawers, replacing outgrown or worn-out clothing, getting new shoes, waiting anxiously for teacher and team assignments and the attendant supply lists. Oh, and buying groceries. Every year, I start my lunch-packing pantry right around 4 weeks before the first day of school, which gives me lots of time to build up a good stash. (Pro tip: Keep these items in a SEPARATE place from the rest of your family’s food, or they’ll get eaten before school starts!) Beginning with shelf-stable items that I know my kids frequently enjoy, like KIND bars, unsweetened applesauce cups and chocolate coconut milk boxes, makes me feel like I have a great head start on a successful school year without doing a lot of work. In fact, I recommend that you make lunch pantry shopping as painless as possible. Add a few items to your shopping list whenever you’ll be at the store anyway, so you don’t have to make a separate trip; or look for good deals from online retailers and have items delivered straight to your doorstep. In the past several years I’ve used online shopping from Target, Amazon and Thrive Market as easy and thrifty sources of healthy shelf-stable lunchbox choices. In addition to buying ready-made items, if you’re ambitious like me, you might use the weeks before school begins as an opportunity to cook and freeze a few things that will make lunch packing easier. Homemade pizza bagels (just top bagels with sauce and cheese and bake), single-serving jars of soup or chili, pancakes and waffles, or more ambitious things like breakfast burritos and mini-quiches are just the tip of the iceberg of fantastic freezer-friendly choices that can make packing lunches so much easier on a busy night. I can’t tell you the number of times over the years I’ve felt like there’s nothing in the house to give to the kids the next day, only to remember a bag of pizza bagels or a stash of meatballs that I popped in the freezer months earlier. A couple of containers of these kinds of sanity-savers is a highly recommended strategy for easier lunch packing, so pick one or two items and add the ingredients to your next grocery list. 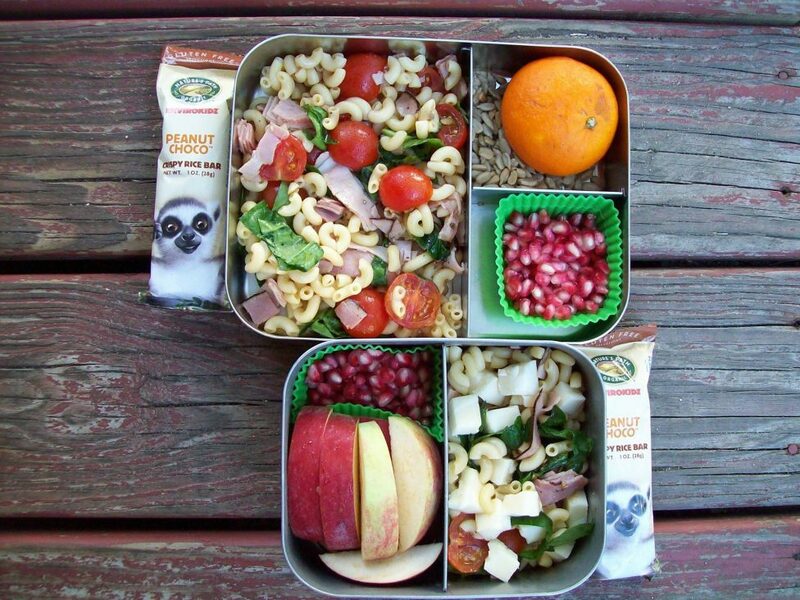 Of course, you can’t pack healthy lunches from shelf-stable and frozen foods alone. As the school year gets closer, sit down with your kids and ask them to help you make a few lists: protein choices, fruits, vegetables, and dairy items that they enjoy in their lunchboxes. Sort those choices into several different shopping lists that include a couple of items from each category, and keep them handy as “add-on” lists to your regular grocery shopping. If you shop from one each week throughout the school year, you’ll be sure to rotate through all the favorites and provide your kids with a varied rotation of healthy packed lunches, keeping the dreaded “lunchbox rut” at bay. Need a cheat sheet? Check out my handy Lunchbox Prep Printable to help get the ideas flowing. Happy back to school shopping!